WMAP First-year Paper Figures, Barnes, et al. 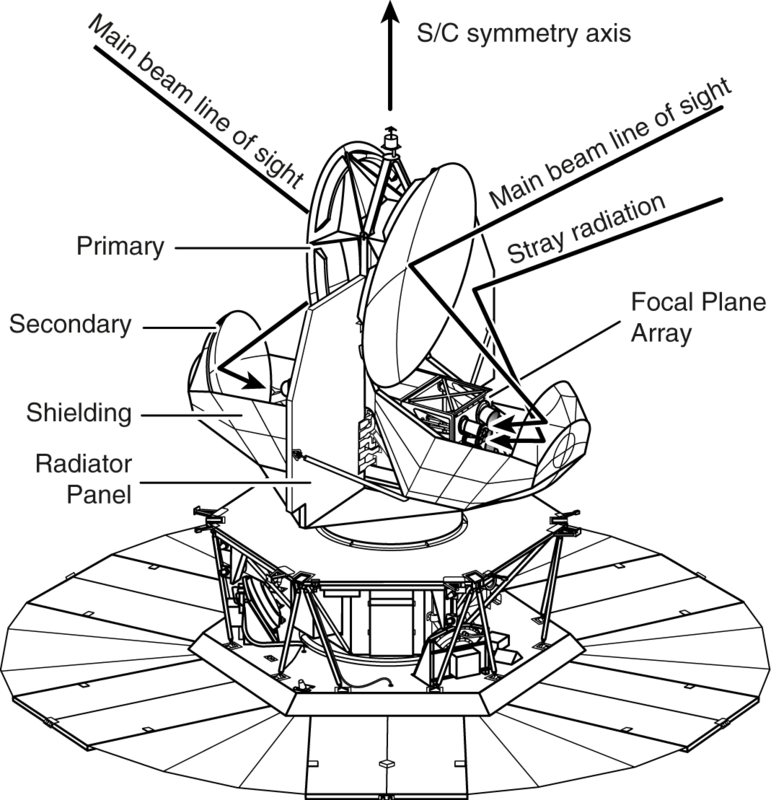 Line drawing of the WMAP spacecraft showing the principle optics elements. Radiation from the sky at 68° from the spacecraft axis of symmetry is reflected from the two back-to-back primary reflectors to the two secondary reflectors. 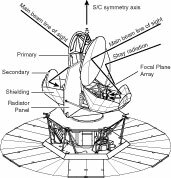 Diffraction shields half surround the secondary reflectors to limit radiation from below. The secondaries reflect the radiation into the arrays of feed horns near the center of the instrument. The main diffraction paths are past the edges of the primary reflectors, either directly from the sky or reflecting from the flat radiator panels behind and between the primaries. Sidelobe intensity maps for each band. Two hemispheres are shown in spacecraft coordinates for each differential antenna pattern. Positive power (A side) is shaded pink, and negative pickup (B side) is shaded blue. Gray indicates regions where |G| < -30 dBi. The main beams lie at the center of each pedestal region (middle of the images, at elevations of ~20°). The main-beam gain is far off the color scales, at +45 to +60 dBi for the K through W bands. The prominent rings of negative gain on the A-side hemispheres come from radiation paths that miss the edge of the B-side primary reflector, and vice versa for the B-side image. The V- and W-band maps were truncated at 10° of elevation because the DADRA model is inaccurate below there. Top: Unpolarized sidelobe-pickup contamination for selected sky maps. For purposes of CMB analysis, sidelobe contributions far from the Galactic plane are most important. Bottom: Polarized sidelobe contamination of the CMB maps. Intensity (Q2 + U2)1/2 is shown as a color scale, while polarization directions appear as red lines. 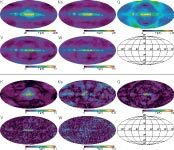 These are sidelobe contamination maps and should not be used to extract information about the polarized microwave sky. They are dominated by signal from the radiometer bandpass mismatch. 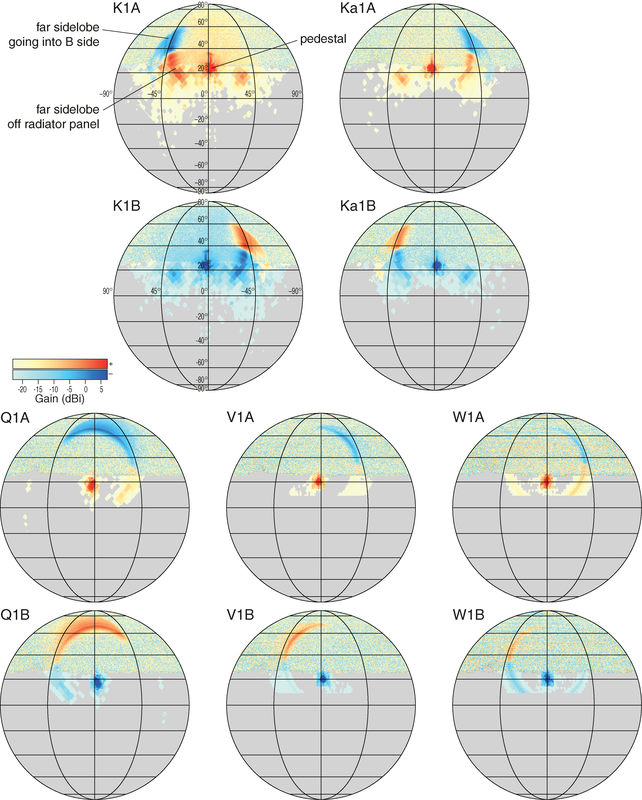 Angular power spectra of sidelobe contamination maps for the WMAP first-year sky maps. 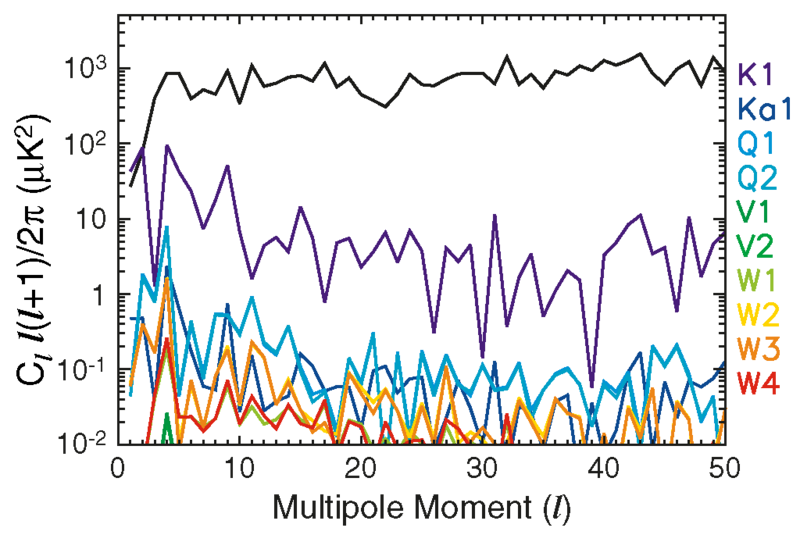 A CMB angular power spectrum is shown in black for comparison. All spectra shown were made with the Kp0 Galaxy +source mask (Bennett et al. 2003c). Absolute value of the cross-correlation between sidelobe pickup and the microwave sky. This is the extent to which sidelobe contributions should contaminate calculated Cl values. 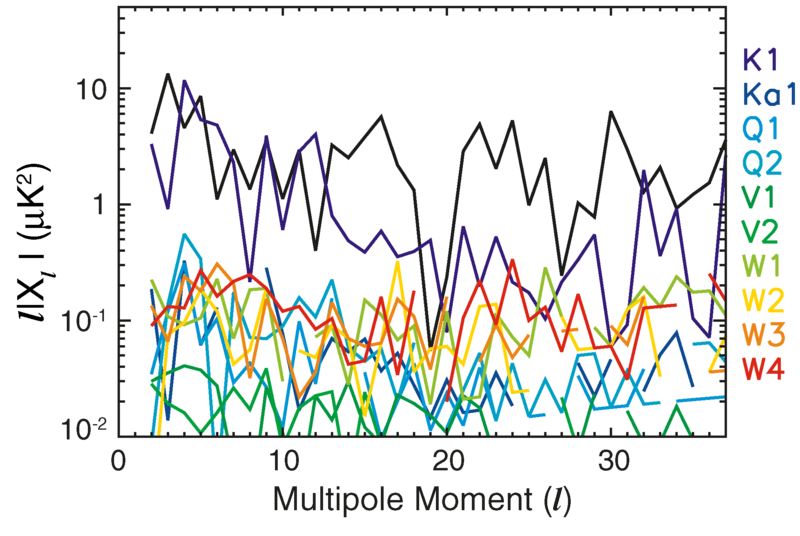 A CMB power spectrum is shown in black for comparison. 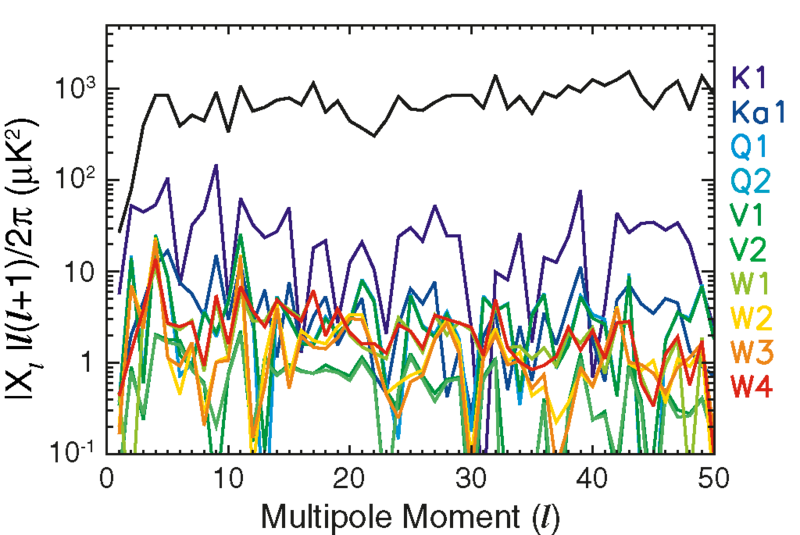 Angular power spectra for polarized sidelobe contamination. These are spectra for the intensity of the polarized pickup; Pl is the angular power of (δQ2 + δU2)1/2 for each radiometer pair. Both bandpass mismatch and polarized foreground pickup are included. This spectrum is not one generally used for CMB analysis but serves to show the strength and angular dependence of the polarized sidelobe contamination. 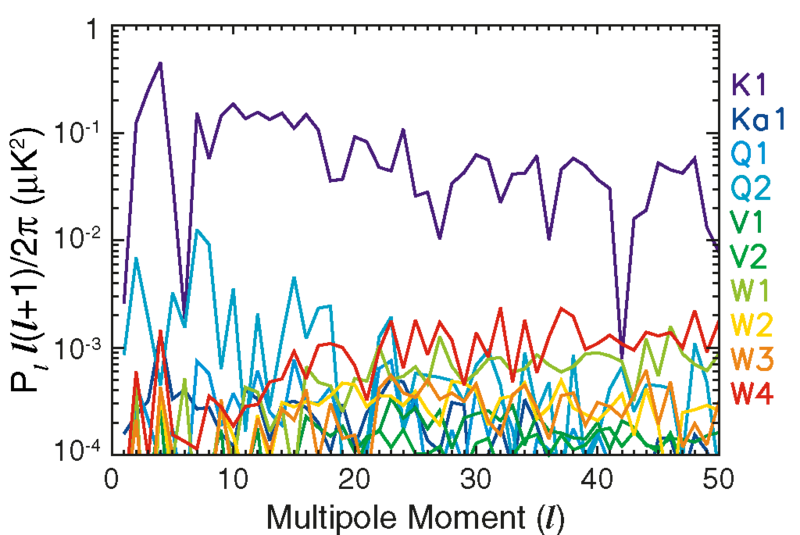 TE angular power spectra for polarized sidelobe contamination. These are the largest sidelobe contributions to the WMAP first-year TE spectra, from the (δQ, δU)sidelobes x (δTcmb). The WMAP reported CMB TE spectrum is shown in black for comparison. 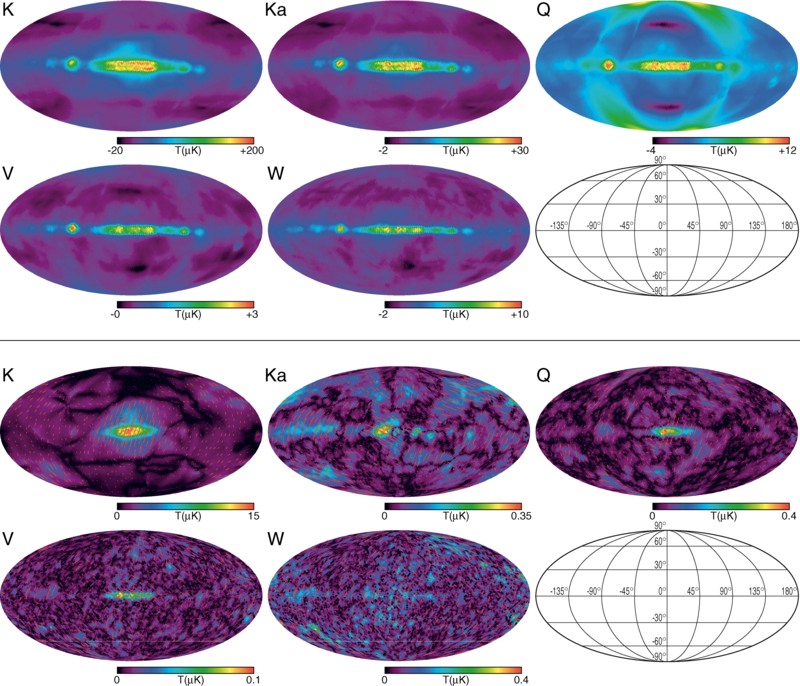 After corrections for Galactic foreground pickup, direct radiometer band pass mismatch, and polarized sidelobe pickup (K band only), K- to W-band data were used to generate the reported TE spectrum at low l. Omitting the K-band changes the reported spectrum very little (Kogut et al. 2003).